Following the huge critical and box-office success of ‘The Social Network’ on its opening weekend, the team behind the planned big-screen adaptation of a movie about Google is hunting for the perfect writer to turn the story of dot-com billionaires Sergey Brin and Larry Page into a blockbuster. 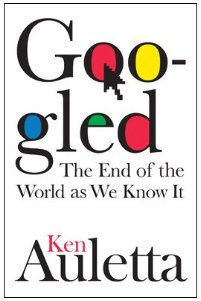 A spokesperson for production company Groundswell told Forbes that the search is on for a writer to adapt Ken Auletta’s bestseller Googled: The End of the World as We Know It into a screenplay, as Aaron Sorkin successfully did for Ben Mezrich’s tale of Mark Zuckerberg and the founding of Facebook. The spokesperson said the team expects to announce its chosen writer in coming weeks. In August, Groundswell’s Michael London announced his company had acquired the movie rights to New Yorker writer Auletta’s book, which chronicles Google’s rise from dot-com upstart to preeminent search engine. At the time of the announcement, it was unclear when the film would make it to the screen, if ever; plans were at a very early stage, with the only names attached to the project that of London and co-producer John Morris. Now, with the success of ‘The Social Network’, a release date for the big-screen adaptation of Googled has been set for 2012, according to Groundswell’s spokesperson. The Los Angeles-based production house is responsible for such critically-acclaimed movies as the Harvey Milk biopic ‘Milk’ and Matt Damon vehicle ‘The Informant’. Watch this space for news on the film, its writer, and its yet-to-be-announced cast. Ideas for who should play Brin and Page are welcome in the Comments section. Not sure if this would be all that compelling. There was very little internal conflict during Google's start-up phase as compared with the Facebook story. It works great as a documentary, for us business-tech nerd types (like The Pixar Story), but it won't have the same draw to the masses as The Social Network.